Small boxes for storing chewing tobacco or snuff mixed with ash provide some of the finest examples of traditional Yup’ik carving. Paul John said, “Back in those days, people really cherished tobacco. They finely crafted their tobacco boxes.” This box depicts a seal on its back with a smaller seal on top, to form the cover. 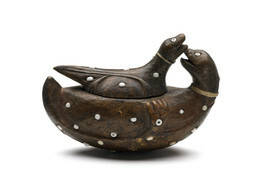 The surface is decorated with white beads and small ivory pegs, and the seals have collars made of bird quill.